Collective bargaining agreements between school districts and teachers unions tell us a lot about the daily operations of the public school system. (Last week, I recapped some of the bizarre things to be found in teachers’ contracts.) In the same way, collective bargaining agreements between teachers unions and their own employees tell us a lot about the unions’ priorities and the compromises they make when acting as management. Copies of staff contracts are notoriously difficult to find, for union members as well as outsiders. Over the years, I have posted some of those I have obtained on the Declassified page of my website. Their details provide the answer to the eternal union member lament: Why are my dues so high? Benefits. 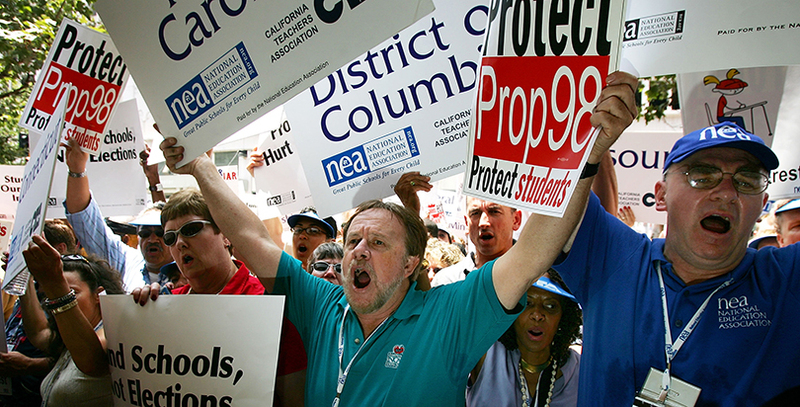 Teachers unions pay generous salaries, but it is the benefits package that incites envy. All union affiliates have a defined benefit pension plan, under which a retiree receives a guaranteed amount for life. Until recently, most union staffers contributed nothing toward their own pension, but that is beginning to change as more unions face financial pressures from unfunded liabilities. Retirement eligibility differs from state to state, but many unions utilize the Rule of 75. That is, an employee can retire at age 55 with 20 years of service. As age increases, the required experience decreases, so one can retire at age 60 with 15 years’ experience, and so on. Pension payments are usually based on the employee’s highest earning year. A 55-year-old can retire with a pension but is still 10 years away from Medicare eligibility, so the National Education Association pays for postretirement health insurance for headquarters employees at at a rate of 5 percent for every year of employment, up to a full 100 percent for 20 years or more. When they hit 65, generally speaking, they go on Medicare and the union provides a stipend for supplementary coverage. Teachers union employees also traditionally have their full premiums paid for disability insurance, group term life, dental, vision, occupational liability, malpractice, accidental death and dismemberment, and salary protection. I also found one affiliate that pays for its employees’ automobile insurance, although it is counted as taxable income. Paid days off. Unlike teachers, teachers union employees don’t get a traditional summer vacation. But they do get quite a few days off. Some affiliates, including NEA headquarters, go to a four-day work week following the union’s national representative assembly over the July 4 weekend and continuing until Labor Day. Union employees get between 12 and 18 days of sick leave per year and three or four personal days. If necessary, they can also use three additional days of childbirth leave, three days of adoption leave, and five days of bereavement leave. One affiliate also offers two additional days for religious observance. At NEA headquarters in Washington, D.C., employees may also be granted time off if federal offices are closed for national days of mourning or Inauguration Day. Seniority and layoffs. It cannot be overstated how important seniority rules are to unions. Most contracts spell out transfer, assignment, and layoff procedures in exquisite detail to ensure they are not detrimental to the most experienced employees. However, you can find seniority provisions in teachers union employee contracts that you would never find in a school district contract. When it comes to layoffs, seniority sometimes gives way to other considerations. One contract does not allow the union to lay off women or minority group members if it would reduce their percentage of the total bargaining unit below a certain point. The NEA headquarters contract bars NEA management from laying off the staff union president, vice president, secretary, treasurer, grievance committee chairperson, and chief shop steward regardless of their relative seniority. Very particular provisions. As with teacher contracts, union employee contracts sometimes contain unique provisions. Some union staffers can receive incarceration pay “for reasons stemming from actions taken by him/her in the scope of his/her Association employment.” The NEA contract specifies that this will be at the regular hourly rate for all time spent in jail. All contracts have nondiscrimination clauses with the usual categories of race, ethnicity, religion, sexual orientation, etc., but one staff contract included nondiscrimination on the basis of weight. NEA is contractually obligated to provide “an appropriately equipped and staffed health services unit” with “a registered or licensed practical nurse.” Also a bicycle rack and an ice machine. As you can see, just because a union sits on both sides of the negotiating table doesn’t mean the contract is any less exacting. For the people who bargain, the more specificity, the better. It comes at a price of flexibility, for both school districts and unions.